It’s a pairing that hits all the right notes. Douglas College Music program alums Jess Cichos and Nicole Broughton have come together to create folk-pop duo The Echos. The two musicians decided to come together in 2013 and perform after bonding over their love of singing while at school. Cichos, a Port Coquitlam resident, and Broughton, who hails from Coquitlam, have both had a passion for music from a young age. And through the connections they made at Douglas, the two we were able to take their dream of making music and bring it to fruition. 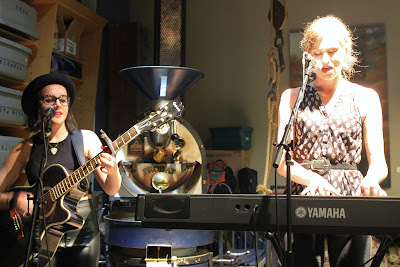 And, through a friend in the Music Technology program, The Echos recorded their demo, Blue, this summer in Kelowna. “Our friend built a studio for herself in her basement, so we road-tripped to Kelowna and spent a week there and recorded and did a couple of videos, too,” Broughton, who plays the piano, said. The EP is currently being mixed and mastered, and The Echos plan to have it available for purchase as soon as possible. “We will alert everyone on social media when it’s ready,” Broughton said. For those who can’t wait to hear The Echos, Cichos and Broughton will be performing Oct. 10 at Studio Records as part of the Best in Vancouver 2015 competition. Doors open at 7:30pm. Tickets are $12. The Echos also perform weekly at the Westwood Plateau golf course’s lounge, Rogue, every Wednesday from 7-9 and will be performing at the PoCo River and Trails festival at Peace Park and Lion Park. “Every time we accomplish something, we just look forward to what’s next. You can have dreams, and that’s a beautiful thing, but you have to work for it – really hard. And that’s what we discovered,” Cichos said.